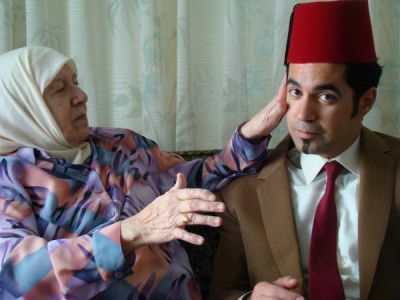 “Grandma, A Thousand Times”... one of the movies in the Arab Film Festival. • TERRIFIC news for opera lovers that CinemaLive and Greater Union Manuka will screen Opera Australia’s famous “La Dolce Vita” production of Verdi’s Rigoletto July 23-27. Elijah Moshinsky originally directed this terrific production. Alan Opie plays the hunchback jester, with Emma Matthews as his daughter Gilda. • BARBARA van der Linden’s next portrait in her marathon Canberra Centenary project series is of graphic designer Frank Arnold. “He looks like Keith Richards from the Rolling Stones and we can imagine his life sometimes runs in close parallel,” she says. • ARTIST Steve Roper is organising an exhibition of work by himself, Mac Nichols, Moira Nelson, Margot Hislop, Terry Everston and Jo Telfer at Cafe Yala at CIT Reid campus, Monday-Friday, until August. The fabulous title? “Woof Cluck Moo Neigh”. No prizes for guessing that animals feature prominently. • THE National Film and Sound Archive tells us that the Film Australia Collection, consisting of about 5000 titles, has been transferred from Screen Australia to the management and care of the NFSA. What a coup. • CARO Roach, ACT ArtsAbility Officer, is naturally chuffed that Federal Arts Minister Simon Crean has announced $500,000 in Australian Government funding for Arts Access Australia, the national peak body for arts and disability. • ROB Riley’s 10th solo show, (and his fourth in Canberra) “Screen Graphics – Common Sites”, is at CCAS Manuka until July 17. Riley’s paintings are “vertically gridded 2D planes with freeform, painterly shapes floating on their surfaces” and owe much to familiar online sites.